Perfusionists monitor a patient during mitral valve repair. 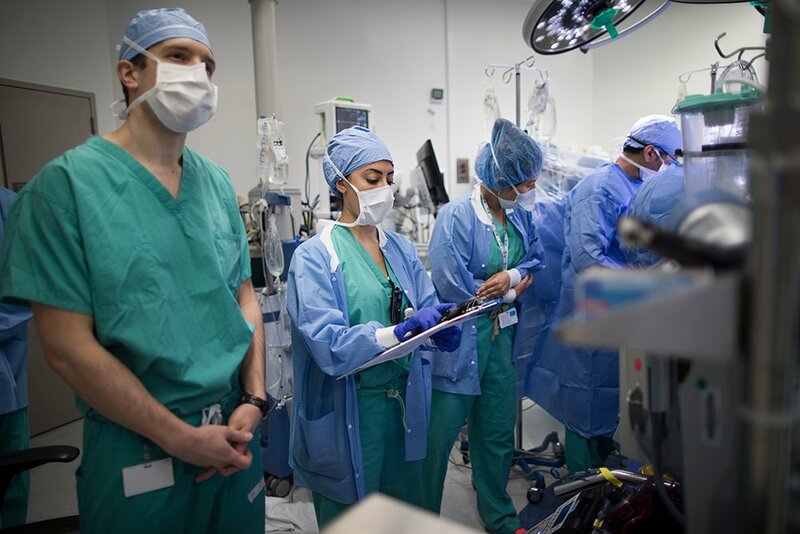 Our Cardiothoracic Surgery Perfusion Services team at the Mount Sinai Medical Center consists of nationally Certified Cardiovascular Perfusionists (C.C.P.’s). These medical professionals are licensed to operate extracorporeal machinery, most commonly the cardiopulmonary bypass circuit, often known as the heart-lung machine, which is used when patients undergo most open-heart surgeries. During cardiopulmonary bypass, the heart is stopped and the lungs are motionless, the patient is kept alive through the care of the perfusionists tending the heart-lung machine. Perfusionists are responsible for the setup and operation of the heart-lung machine and any other circulation equipment necessary to support or temporarily replace a patient’s respiratory or circulatory functions. Outside the operating room, Perfusionists are responsible for the management of assist devices such as temporary life-support (ECMO) extra-corporeal membrane oxygenation for adult or pediatric patients with heart and lung defects. ECMO bypass can run for a period of few days or few weeks to allow time for the patient to recover or be used as a bridge to transplantation.